ESA's Branches are designated on the basis of geographical contiguity for the purpose of holding meetings, providing an opportunity for presentation of papers, and stimulating interest in entomology. ESA members automatically become members of geographical Branches based on the mailing address they provide when they join the Society. Each Branch has elected officers. An annual meeting is held in each Branch so that members benefit from interacting with others in a specific region and sharing scientific information on topics of interest to that region. Members may change their automatically assigned default branch by contacting ESA. And they may join multiple Branches for a small fee. To view Branch officer rosters, Branch meetings, and other information, please select from the following links. You may also click here to view the details of all Branch meetings that are currently available. 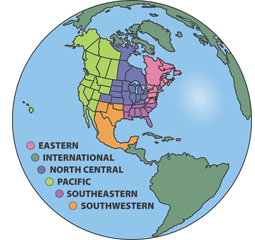 Membership in the International Branch is for ESA members who reside outside of the following areas: United States, Canada, Mexico, American Samoa, the Federated States of Micronesia, Guam, Johnston Atoll, Commonwealth of the Northern Mariana Islands, Midway Islands, Puerto Rico, the United States Virgin Islands, and Wake Island.